John Joseph "Johnny" Podres (September 30, 1932 – January 13, 2008) was an American left-handed pitcher in Major League Baseball who spent most of his career with the Brooklyn / Los Angeles Dodgers. He is perhaps best remembered for being named the Most Valuable Player of the 1955 World Series, pitching a shutout in Game 7 against the New York Yankees to help bring the Dodgers their only World Series title in Brooklyn before their move to Los Angeles after the 1957 season. He later led the National League in earned run average and shutouts in 1957, and in winning percentage in 1961. He was of Lithuanian-Polish descent. Podres helped the Dodgers win World Series championships in 1955, 1959, 1963 and 1965, although he did not pitch in the 1965 World Series itself. In the 1955 series, after the Dodgers lost the first two games to the New York Yankees, Podres pitched a complete game, seven-hit victory on his 23rd birthday in Game 3. In the climactic Game 7, Podres pitched a 2–0 shutout to bring Brooklyn its only World Series championship. Podres was given the first-ever World Series MVP Award by Sport magazine and presented with a red two-seater Corvette. Later he was honored as the Sportsman of the Year by Sports Illustrated magazine. In his 15-season career, Podres compiled a 148–116 record with 1435 strikeouts, a 3.68 ERA, and 24 shutouts in 440 games. He was at his best in the World Series, losing his first Series game (in 1953), then winning four straight decisions over the next decade. In six Series games, he allowed only 29 hits in 38⅓ innings, with a 2.11 ERA. When his playing career ended after stints with the Detroit Tigers and San Diego Padres, Podres served as the pitching coach for the Padres, Boston Red Sox, Minnesota Twins and Philadelphia Phillies for 23 seasons between 1973 and 1996. Among the pitchers he worked with were Frank Viola and Curt Schilling. In 2002, Johnny Podres was inducted into the National Polish-American Sports Hall of Fame. He later settled in Queensbury, New York and died at age 75 in Glens Falls, New York, after being hospitalized for heart and kidney ailments and a leg infection. Podres was survived by his wife of 41 years, the former Joni Taylor of Ice Follies fame, and his two sons, Joe and John Jr. He is interred at Saints Peter and Paul Cemetery in Moriah, New York, which is in the Adirondack Park. 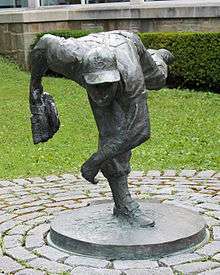 ↑ "Lithuanian-American Johnny Podres (1932-2008): US baseball's 'most valuable player' in 1955". vilnews.com. Retrieved November 11, 2016. ↑ "Johnny Podres Baseball Stats by Baseball Almanac". www.baseball-almanac.com. Retrieved November 11, 2016. ↑ "Johnny Podres dead at 75". New York: Daily News. January 14, 2008. Retrieved 2011-05-17. ↑ "Lefty Podres, who clinched Brooklyn's only Series title, dies at 75". ESPN. Retrieved 2011-05-17. 1 2 Goldstein, Richard (January 14, 2008). "Johnny Podres, Series Star, Dies at 75". The New York Times. p. A22.